ESCO understands the old expression, “time is money”, so to eliminate wasteful time in dropping multiple bags into wheels and carrying multiple SKU’s of product. ESCO designed a “BULK” 282 oz. bucket of beads [Model #20466C] for easier use in shop and shipping to customer. 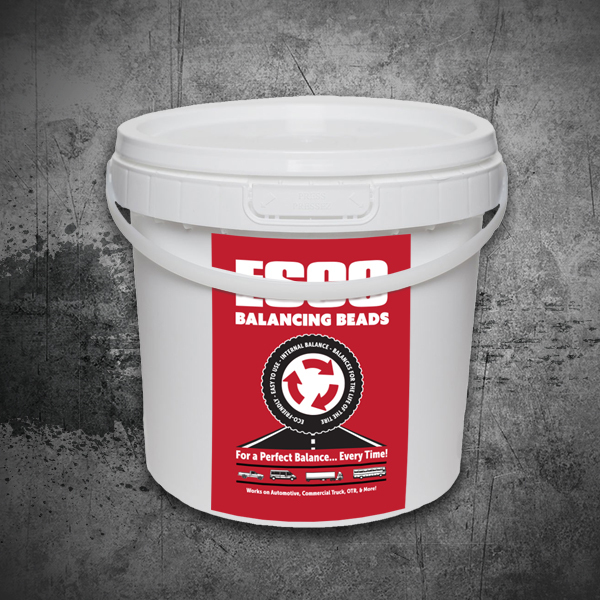 As simple as “scooping” from the bucket, ESCO’s bucket of Balancing Beads has become the #1 option for many tire service and fleet operations around the world. Each bulk bucket of ESCO Balancing Beads comes with a tire size application chart telling you exactly how many scoops are needed. 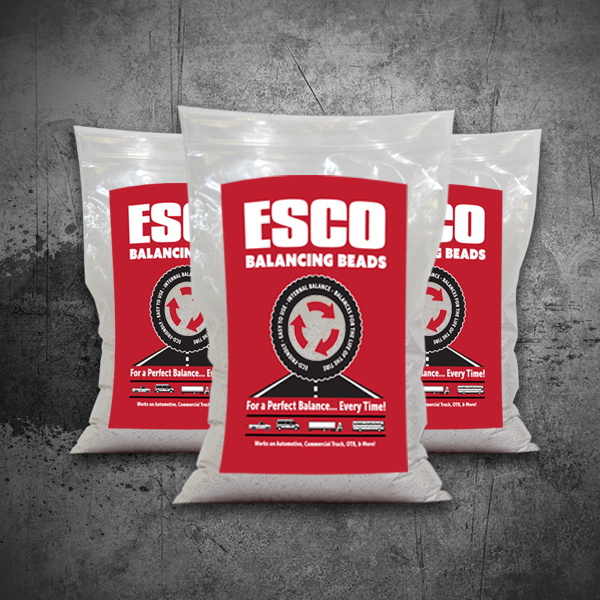 ESCO Balancing Beads are Universal and can be used for all tire types including Motorcycle, ATV, Automotive, Truck, Tractor, Trailer and RV tires. ESCO Balancing Beads are 35% larger than our competitors…therefore no special fitted valve cores are required with ESCO Balancing Beads. Other competitor beads are much smaller and can block the valve stem causing premature leaking. Our larger beads also make ESCO Balancing Beads much easier to reuse over and over again…consistent reusable media equals increased profits. BIGGER IS BETTER! ESCO Balancing Beads are made of a 100% solid ceramic and are much harder compared to competitive products made of glass. Because competitive products are made of glass, over time they will begin to break down, misshape and leave you with dusty powders or ground glass which will eventually abrade the inner liner… thus rendering them “unusable”. This is a difficult situation because you will then have to replace ALL of the beads inside of the tire because there is no way to tell which are still good and which have been misshaped! As ceramic is a harder medium, ESCO balancing beads will withstand time and abuse inside the tire. The harder the material, the longer it will maintain its shape and overall effectiveness. Based on the MOHS Scale of Hardness, ESCO Balancing Beads come in at 7.0 versus the competition, 5.5…so why is this important? A balancing product that is nice and round with a smooth surface can only perform properly if it stays that way over thousands of miles! Competitive brands require you to use a special fitted valve core to keep the beads from entering and damaging valve stem, leading to lose of air and potential harm when releasing air from the tires. This means more time and labor are needed to install the special valve core and limits you in valve core options. No fitted or special valve cores are needed with ESCO Balancing Beads!